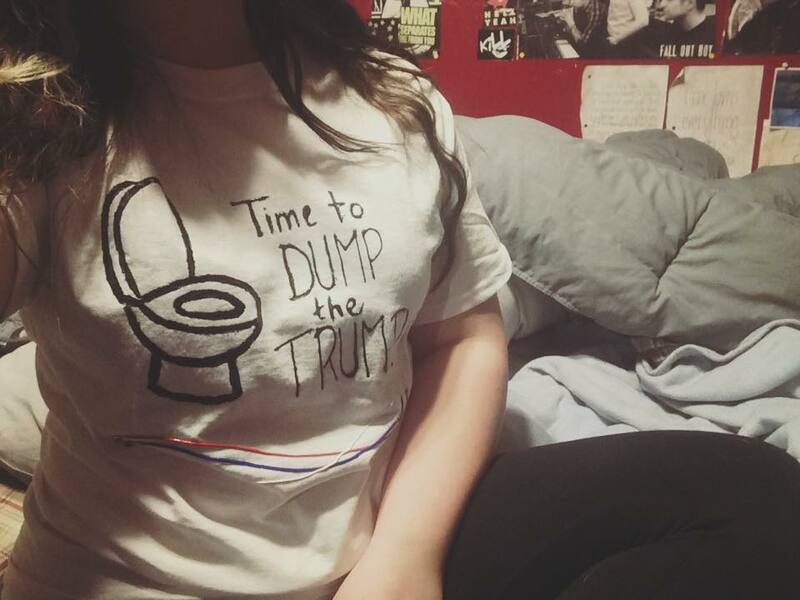 The woman’s shirt in the article you link to—a white T-shirt illustrated with a toilet and the phrase “Time to Dump the Trump”—brings to mind something my father always told me: Dress for the Trump Rally you want ... and make sure to use puffy paint when you’re drawing the toilet. Or something. Due to the sheer volume and ferocity of disruptive protesting going on during our current election cycle, everyone—candidates, supporters, protesters—are claiming that their First Amendment rights have been violated. Everyone! So let’s start with the fundamentals. You didn’t mention it directly, but let’s talk about the First Amendment. Specifically, all 45 words of it. Subject to many exceptions, the government can’t limit your right to express yourself or to peaceably assemble. This is important because, as you imply in your question, there can be a difference between expressing yourself on private property and expressing yourself on public property. The First Amendment does not apply to private parties; it only restricts actions by the government. Being a private citizen in control of private property, you can pretty much make all the rules you want. You can revoke permission to be on your property from any people who don’t follow your rules, and, if they don’t leave, they are trespassing. And if someone’s trespassing, the owner—or someone authorized by the owner—can boot the trespasser. We previously discussed some of the perils of being a trespasser here. A traditional analysis of First Amendment rights on public versus private property usually includes a view on actual private property, and then runs through various kinds of public property where speech might be limited (under what’s called the Federal Forum Analysis). But this isn’t a traditional analysis. We’re not talking about whether someone needs a city-issued permit to exercise free speech on a public sidewalk, or if a university can refuse the use of an auditorium by a single group with a certain viewpoint. We’re talking about someone exercising his or her free speech in the space that somebody else procured to exercise his or her own free speech. On this point, the rallies I’ve seen this campaign cycle with protesters being booted are either on private property or are rented out to a campaign, including at public universities. In the latter case, you’ve essentially got an events contract executed by the campaign for the same space that Kenny Loggins would rent out for a concert (he’s big on the community college circuit). As much as Sanders supporters would like to think it’s the case, Bernie doesn’t just float up on a cloud to a makeshift woodland amphitheater and expect his followers to flock to him like adorable forest animals to Snow White—no, his campaign signs a contract for the use of such a forum. As a result, even if a public university stadium is used for one of these rallies, it’s rented to and in control of the campaign, making it arguably the equivalent of private property for the purposes of protesters in attendance. This means that if the person in control doesn’t like you and wants you out, then you’re out. Now, here’s an issue: When you’re being escorted out of a “private” rally like that, is it private security or is it the police doing the heavy lifting? If it’s private security, there is no First Amendment issue (i.e., no government action). But even calling the police to remove an unruly or unwelcome individual from a “private” event does not offend the First Amendment. After all, you may call the police to remove from your front lawn the highly disagreeable folks who, against your clearly stated rules, insist on espousing their enthusiasm for India pale ale or the Fast and Furious movie franchise, and yet there is no First Amendment problem. “Courts have found no First Amendment violation when police remove unwelcome interlopers from statewide political party events,” Zansberg says. In fact, even if the political rally is an actual government-sponsored event, the government can place reasonable, content-neutral restrictions on the time, place, and manner of a protest at a rally. For example, it may be in the best interests of safety to keep two groups apart from each other if one or both, say, are clearly up for fisticuffs after a short fuse of provocation. And, of course, there’s the dystopian “Free Speech Zone,” clearly named by Frank Luntz immediately following an ill-advised binge on both methamphetamines and George Orwell books. In the example you provide, it looks like the woman and her friend were keeping it cool, but were singled out as being physically disruptive. Regardless, in this case, because it was a private space, we’re not looking at content over form in terms of expression. If you’re walking into the lion’s den with a Trump-themed toilet on your shirt, be smart and document everything—this includes using your phone to make an audio recording from entrance to exit, which gets sent straight to the cloud. Consider using video, as well. You’re not likely to find a lot of allies willing to be a friendly eyewitness in a situation like that. 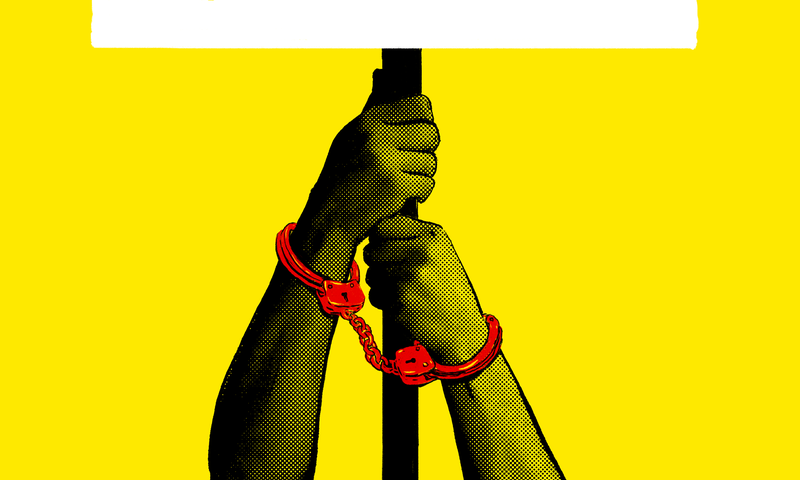 And your recourse is going to be limited to whether the way you were treated exceeded civil or criminal standards for any person being escorted out, and possibly if you were assaulted by zealous supporters during your stay. If you do intend to rabble rouse and be provocative, get ready to be asked to leave, physically escorted out, arrested, or more. And do some minimum research at, say, your local ACLU chapter website, because it’s easy to move into the realm of civil disobedience, something you’re going to need to be prepared for. Also, remember that what we’re talking about here is the circumstance of getting ejected from what amounts to a private function: Different rules apply under other circumstances. In the meantime, remember that puffy paint may win minds, but thoughtful and tasteful screen-print wins more hearts. Or Sharpie, for that matter.